SUBSCRIBE NOW AND SAVE 44%! Subscribe now to The Fly Fishing Authority dedicated exclusively to coverage of fly-fishing tactics, gear, destinations, news, and fisheries conservation. Yes No May we send you special subscription offers? Yes No Would you like to receive exclusive offers from our carefully selected marketing partners? SUBSCRIBERS' AUTOMATIC RENEWAL FEATURE: I understand that I will receive uninterrupted service and delivery of my magazine and that my subscription will be automatically renewed each year at the rate then in effect. I won't be bothered with any renewal notices in the mail; instead, I will receive a clearly marked annual reminder about 60 days before my credit card is charged or a bill is sent. I may cancel at any time during my subscription and receive a refund on any unmailed issues by calling 1-800-877-5305 or visiting Subscriber Services. If giving a gift, this does not apply to your subscription or your gift subscription. Savings % based on annual cover price of $35.94. 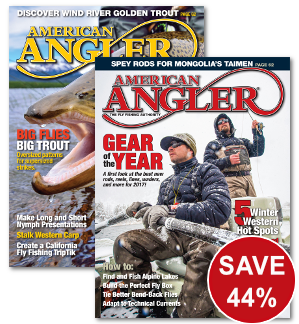 American Angler publishes 6 issues per year. If you are ever dissatisfied with your subscription for any reason, you may cancel and receive a full refund for all unmailed issues. Copyright © American Angler Magazine. All Rights Reserved. Reproduction in whole or in part without permission is prohibited.